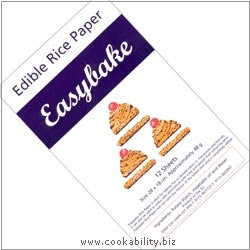 Twelve sheets 28x18cm of Easybake rice paper which is ideal for baking flat or domed cakes i.e. macaroons and biscuits. It can also be used to make cake decorations with icing and special food colouring pens. This rice paper will not taint the flavour of the baked item and is completely edible. Ingredients: Potato starch, vegetable oil and water.